Andrew and Jamie are two of the sweetest people you’ll ever meet. It is impossible for them to be any nicer. IMPOSSIBLE. I met them for the first time for their engagement session, which took place on one of the only cold and gloomy days in California. Surprisingly, their wedding (at the beginning of August) was also gloomy! What?! Come on California! Despite the seemingly unfavorable weather, because it was overcast during the day, we could shoot anywhere at the ceremony location because we didn’t need to worry about which direction the sun was facing. Yay for variety! The sun did come out at certain points throughout the day and there was an EPIC sunset. The epic sunset was then followed by RAIN. WHAT?! IN AUGUST? (I’m going to need to talk to California about this….). It is supposed to be good luck for it to rain on your wedding day and luckily it happened right at the end of their reception. WIN WIN. At our one month consultation I asked Jamie about the details of their wedding day and she responded ” Katie, just do your thing” and as she said that I just wanted to jump for joy. Her complete trust allowed us to take images as they happened and as you’ll see in the post, we captured some pretty awesome moments. They got to sit in and pose with a light blue vintage PORSCHE. It was epic. Also just so happened to match their wedding colors. The bouquet toss involves one of the most epic catches EVER. (You’ll have to see below). Jamie and Andrew have the cutest parents. You’ll see below. 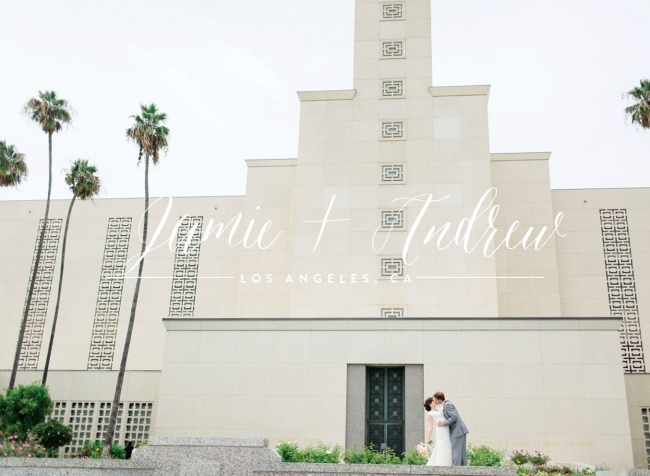 Their ceremony was held at The Los Angeles Temple of the Church of Jesus Christ of Latter-day Saints. Their temple is very sacred, so we weren’t able to enter to photograph the actual ceremony, but we were able to take pictures of Andrew and Jamie as they exited the temple and then on the grounds. 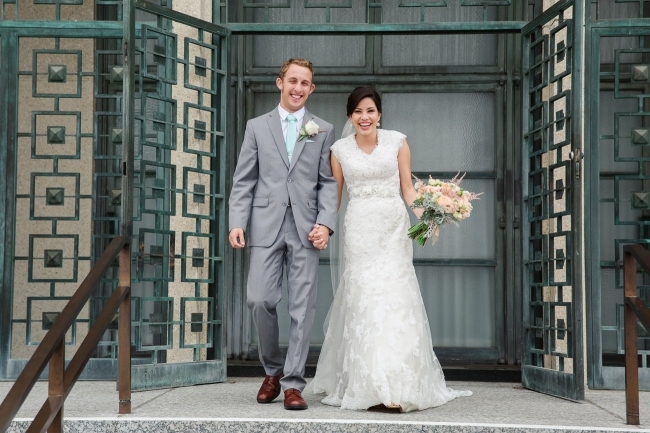 As we walked around the temple, Jamie described why she loved each area and it was so helpful when capturing their portraits. I loved being able to use certain areas that I knew were special to them. I hope you love some of my favorite images from their wedding day! Everyone was so excited for them! Oh my goodness, don’t you love them already?! Because their guests weren’t able to witness their ceremony in the temple, Jamie and Andrew did a ring exchange at the reception location. Here is that Porche I mentioned earlier… No big deal. They had a “create your own flavored water bar” — so cute!! After editing these next few images, I got really hungry and for some reason I got a craving for S’mores. Oh my goodness. I’m obsessed with this next picture of Jamie’s parents. I love these candid moments. I’ve never seen someone catch the bouquet while being carried by someone else!